When Moloch went on his rampage, he made the first ice ages. His attack was slow, but his destruction came swift. Many life forms were destroyed; the entire Eocene completely collapsed. Ice caps formed in the north and south poles, becoming permanent additions to the world's ever-changing climate. Animals that otherwise dominated the planet died out. His attack upon Earth destroyed many a habitat; many an ecosystem. Thanks to him, thousands of animals went extinct. What he didn't know was, on his way back, one species followed him. They were a species who, on Earth, were destined to die out while their cousins took to the waters. They were the hooved carnivores; Andrewsarchus was their ancestor. They were literally sheep in wolve's clothing; a line of carnivorous mammals that grew to enormous sizes, but died out as the world around them began to freeze or dry up. They followed Moloch back into the Stygian Tundra, and it changed them. No longer were they mortal animals tied down by the grip of climate. Now they were frozen beasts of the Stygian Tundra. They were beasts of primal fury, borne to Moloch's iron and insane will. They became the Toothed Horrors, and they have stalked the snow of the Stygian Ice ever since. Toothed Horrors wander the icy realm of the Stygian Tundra for as long as they've been around Inferis. Essentially its natural carnivores, they act as also as its guard dogs. Any demon that doesn't belong to the Tundra or is 'invited' by Moloch is stalked and hunted by these creatures. They have a particular taste for mortals, however; perhaps an instinctual need for the substance from the world in which they came from. Abilities: Toothed Horrors are powerful animals. Not much has changed biologically from their original forms as Andrewsarchus; they are large, powerful carnivores with long, sharp teeth, roughly about 25-30 feet in length, with snarling jaws and padded, hoof-like feet. However, the Stygian Tundra managed to change them and they have since 'evolved' to become its most powerful predators. They attack using ambush tactics, striking from the icy crags of the Stygian Tundra, attacking with their jaws and ripping prey to shreds. Inferis also managed to change some of their biology, affecing their systems so that now they can actually breathe ice; firing it in a cone in front of them. It does not do much damage-wise, but it does slow prey down; making it easier to disembowel them. - Moloch calls them "his little puppies" and likes to cuddle with them. Legion's been trying to tell him that they aren't actually dogs, but at this point he's given up trying. 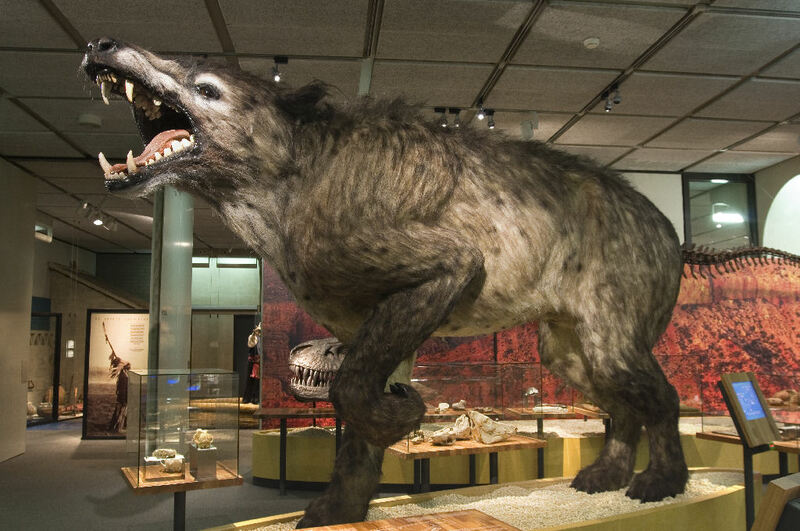 - Toothed Horrors are descended from Andrewsarchus, the only known hoofed carnivore; a legitimate sheep in wolf's clothing.